The accordion war: Why does the front in Libya keep moving back and forth? Why has the front line in Libya been moving back and forth like an accordion for a month and a half? How was it that the rebels took so many towns so fast in February, and then got pushed back so quickly, until Gaddafi’s tanks were rumbling through Benghazi’s outskirts? And why do the towns in oil-rich north-central Libya, along the Gulf of Sirt – towns like Brega and Ras Lanuf — keep changing hands? To answer these questions, it helps to think about this war in phases. There have been three phases so far, and we now seem to be in a fourth, which began in late March. The revolution’s official start date is remembered as February 17, but demonstrations actually began in Benghazi on February 15, mobilized by youth via Facebook and other social-networking sites. In Benghazi and other cities, Gaddafi’s internal-security forces fired on demonstrators, causing mass outrage. Soon, demonstrations spread all over Libya. State-security buildings and other symbols of Gaddafi’s rule (such as the headquarters of the Revolutionary Committees in many cities and towns) were torched. The regular Libyan army has long been weak, because Gaddafi – afraid of a coup d’état – starved it of leadership and resources, diverting them to militias that report to his sons and to close relatives. (To understand why, look east to Hosni Mubarak, abandoned by his top military brass under popular pressure.) Within the effete Libyan army, only the special forces and a few other detachments were particularly effective. But the militias, especially those under the colonel’s son Khamis, were reasonably well trained, albeit largely for maintaining internal order. Within a week, as it became clear that a popular uprising was afoot, defections from the regime and the military apparatus began. The most prominent defector was Mustafa Abdul Jalil, Gaddafi’s justice minister. In Benghazi and many other cities, police and state-security officials either joined the rebel movement as sympathizers or simply surrendered. Most of the militias stuck with the regime, however, being under Gaddafi family control. Here’s a useful map from the BBC of key sites referenced in this post. In Tripoli, where many of the various Gaddafi militias are based and where Gaddafi’s supporters are concentrated, the security presence was too strong, and isolated demonstrations were too viciously suppressed, for full rebellion to break out. The east, with Benghazi at its heart, liberated itself quickly. There, the defection of a few elite units from the Benghazi barracks of the Libyan army proved decisive. On February 20, a day of chaos, 1,000 soldiers from the Benghazi contingent of Al-Sa’iqah (the Libyan special forces) joined the opposition. So did Interior Minister General Abdul Fattah Younis and General Khalifah Al-Mismari, a senior Al-Sa’iqah figure. The Al-Sa’iqah forces in eastern Libya who joined the opposition have proven critical to those successes the opposition military has had. They are among the few fighters on the opposition side who are properly trained and under any kind of organized command. In late February and early March, untrained, lightly armed rebels (thawwar) – mixed with elements of Al-Sa’iqah – took control of a number of towns in which state security forces had not switched sides or had only been weakly present. This was when maps on international news broadcasts showed town after town falling to the rebels. In early March, the regime’s militias regrouped and quickly retook cities from the opposition. Why did this happen so fast? In Benghazi, people on the street allege that Gaddafi had finally imported enough mercenaries from sub-Saharan Africa to field an effective and compliant fighting force. But the extent to which foreign mercenaries are important to the regime’s military effort is nearly impossible to pin down. Regardless, by early March, the regime’s militias had re-armed, supposedly with newly purchased, up-to-date weaponry, and began a well-coordinated wave of attacks that swept back across towns defended by the disorganized rebels. Watching Gaddafi’s forces rumble almost unchecked toward Benghazi, Libya’s second city (population 700,000), the UN Security Council passed Resolution 1973 on March 17, authorizing “all necessary measures” to protect civilians. But by March 18, Gaddafi’s forces had finished sweeping eastward through the oil towns of central Libya and had reached Benghazi’s outskirts. 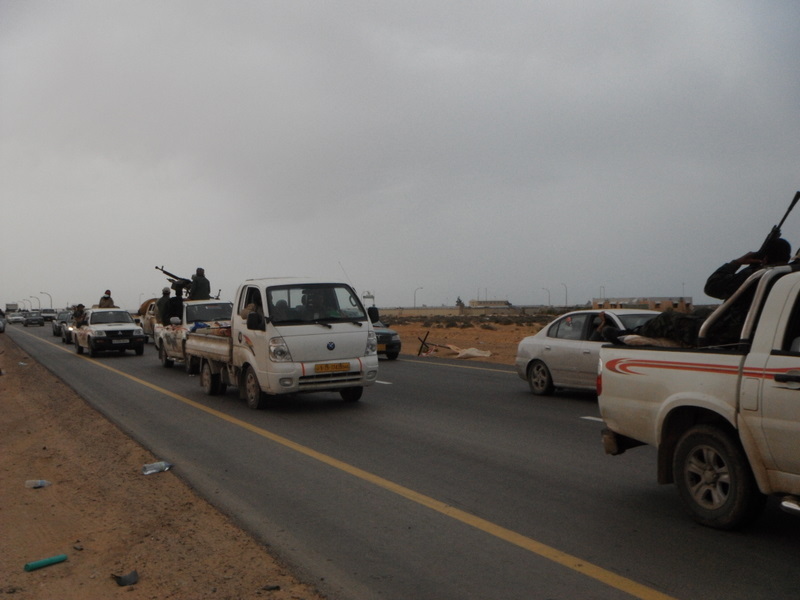 On March 19, Benghazi residents streamed east out of the city. Street battles occurred in Benghazi, both in the outskirts and downtown, where locals report that Revolutionary Committee members who had been buying up light weaponry on the new black market for arms emerged from hiding and began shooting at civilians. Benghazi remained chaotic for several days. It was here that the untrained rebel fighters proved relevant, patrolling and protecting the city as best they could. Coalition air strikes against Gaddafi’s forces also began on March 19. The significance of these air strikes in turning the war’s tide cannot be overstated. Relative to Gaddafi’s superior firepower and financial resources, the opposition’s military forces are underequipped and utterly disorganized, with the exception of the handful of Al-Sa’iqah and other trained military forces that had joined the opposition. But with the air strikes, the opposition began moving apace out of Benghazi and the east, retaking cities like Ajdabiyah, Brega, and Ras Lanuf in east-central Libya’s oil belt. The air strikes also significantly reduced the regime’s shelling of several contested cities, especially Misrata, Libya’s largest port and third city (population 400,000), located in center-west Libya. March 22-26 were heady days for the Transitional Council (i.e. the interim opposition government). First, the Coalition wiped out Gaddafi’s air force. 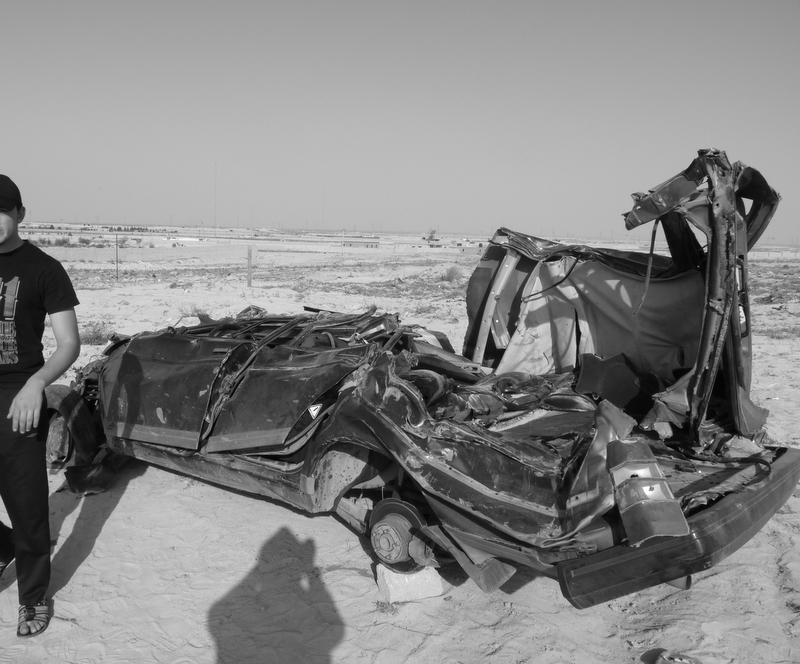 Then, along the coastal highway leading from Benghazi to Sirt, Coalition planes bombed Gaddafi’s tanks and heavy artillery, leaving their charred, pancaked remains along the road. The regime’s militias had no choice but to retreat posthaste. The opposition military swept forward completely unchallenged through the oil towns of Ajdabiyah, Brega, and Ras Lanuf, closing on Gaddafi’s hometown and stronghold of Sirt. A rebel victory appeared imminent. The loss of Sirt, where support for Gaddafi is strong, would have left the regime reeling. The Coalition’s air strikes, especially along the highway from Benghazi to Sirt, created the expectation among opposition supporters in Libya that the Coalition was willing use air power to help pave the way for their advance to Tripoli. Coalition leaders, especially Nicolas Sarkozy, were hailed as heroes. The French tricolor fluttered in Benghazi’s central square. But in late March, Coalition bombing against Gaddafi’s forces scaled back dramatically on the eastern front (while remaining intense against Gaddafi military strongholds in Tripoli and around besieged cities). 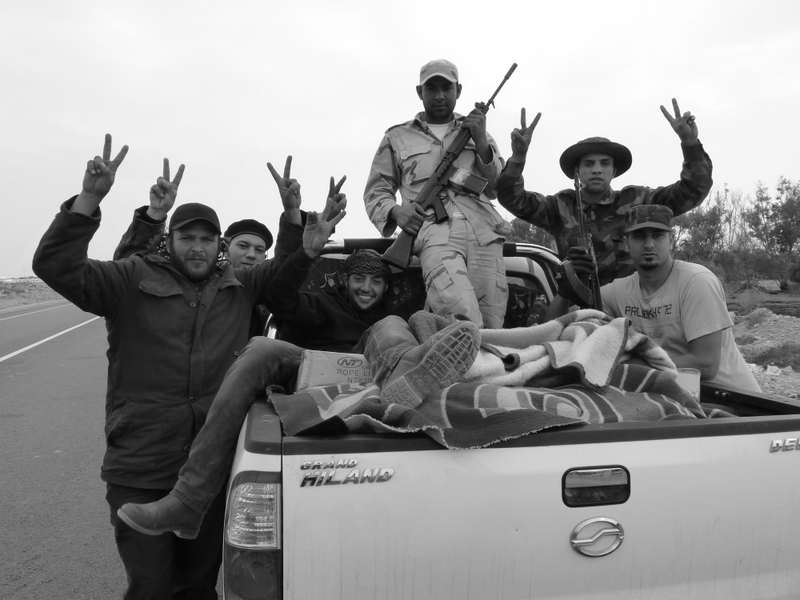 The opposition forces, who had been closing on Sirt, stopped in their tracks. For a week, rebels on the eastern front had waltzed down the coastal highway, along the path that Coalition planes were clearing for them. Now, they began retreating in the face of Gaddafi’s superior firepower. “Where’s Sarkozy?” asked rebels on the eastern front and unnerved civilians in Benghazi. The Coalition, for better or worse, had created a set of expectations in Benghazi. Now, the view from Benghazi was that it was changing course. 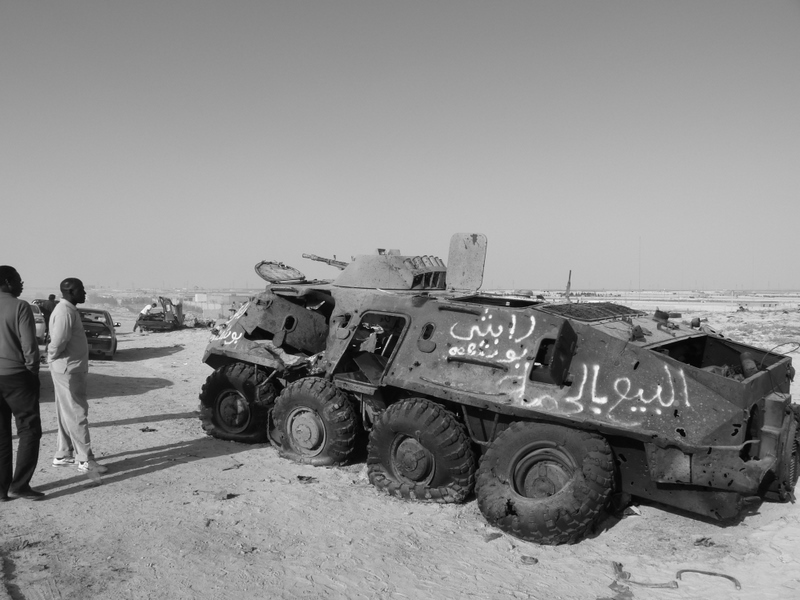 As of April 2, after several days of advance eastward by the regime’s militias, the front line in the east appears to be stalled around the town of Brega. In Benghazi, the mood remains nervous, as people wonder why the Coalition bombing has stopped and whether this means the international community has abandoned them. Meanwhile, the fiercest battles of all are raging in besieged cities like Misrata. – In Phase 1, the ragtag rebels – plus Al-Sa’iqah and other regular units who joined the opposition and did a large portion of the fighting — had been able to advance because Gaddafi’s militias were caught unprepared. – In Phase 2, Gaddafi regrouped, and his militias’ vastly superior firepower and coordination capacity pushed the front line to Benghazi’s doorstep. – In Phase 3, Coalition air strikes began doing all of the heavy lifting that the opposition forces are simply incapable of doing themselves, and the opposition looked ready to follow Coalition planes all the way to Tripoli. – In Phase 4, Coalition air strikes have diminished almost entirely. The opposition forces are too lightly armed and too disorganized to advance without them, forcing a stalemate. There is intensive back-channel negotiation going on. Why has the Coalition scaled back its air strikes in the east? The likely answers have as much to do with the international climate as with events within Libya. On March 27, word spread that the rebels had taken Sirt. Here in Benghazi, the press corps started asking around about hotels in Sirt and packing its bags, reading to ride west with the rebels all the way to Tripoli. Although the rumor of Sirt’s fall proved false, it underscored how fast the rebels were now advancing with Coalition help. They may have been moving too fast for the international community’s taste, threatening to make apparent that the Coalition’s air strikes had progressed beyond simply defending civilian areas to facilitating Gaddafi’s military defeat. Multilateral intervention is proving a tricky game. Security Council members Russia and China and key NATO members Turkey and Germany remain deeply wary about intervention. Domestic debate is mounting within France, the United Kingdom, the United States, and other Western countries about “mission creep,” the potential unforeseen consequences of intervention, and who exactly the opposition leaders are. NATO has taken over command and control of all Coalition operations over Libya, and its leaders appear to be taking a wait-and-see approach. Meanwhile, intensive back-channel negotations are taking place inside and outside Libya, with the aim of loosening Gaddafi’s grip on the regions and people he controls. Leading regime figures are reaching out to Western leaders, testing the waters to see if defection makes sense. On March 31, Gaddafi’s foreign minister and spy chief Moussa Koussa – a man with a checkered past, with possible ties to the 1988 Pan Am bombing over Lockerbie – defected. Others are likely to follow. It’s also safe to assume that spooks from the CIA, MI6, the DGSE, and any other Western intelligence agency worth its Sirt are in Libya, trying to convince leaders of major tribes and politically influential families that remain with Gaddafi to jump ship. With the above chronology in mind, there are a few reasons why this has been an accordion war. Reason #1: Gaddafi’s forces are stronger than the rebels, but the Coalition is stronger than Gaddafi. There has been back-and-forth movement because of a radical imbalance between the three parties to the conflict: the opposition forces, Gaddafi’s forces, and Coalition air power. – When they fight limited, unprepared government forces (Phase 1), the rebels advance quickly. – When Gaddafi’s force mobilize their full strength against the rebels (Phase 2), the rebels retreat quickly. – When the Coalition unleashes air strikes in advance of the rebel line, the rebels advance quickly (Phase 3). Reason #2: There’s a whole lotta nuthin’ in north-central Libya. The oil towns in the 300 km between Ajdabiyah (population 150,000) and Sirt (population 140,000) are small developments purpose-built for engineers and technicians. Walking around them feels like walking around a low-end retirement community in the United States: reasonably well-manicured shrubbery sits in front of identical cubical home after identical cubical home. Each community houses a few thousand oil workers, all of whom have now evacuated, leaving the towns deserted. There’s not much space for intensive urban warfare. And between these oil towns are long stretches of desert highway, with nothing else but the occasional rest stop, refinery, or oil harbor. There’s nowhere to fight. Thus, when one side or the other advances through this area, it advances fast, behind a barrage of rockets, mortars, and bombs. Right now, there’s no military apparatus outside Tripoli with the organizational capacity to train the rebels anyway. “And where did you go to enlist?” I asked. He laughed again. “There’s no enlisting. You just find a weapon and show up at the front. If you don’t have one, you wait until another rebel dies and you take his. Or you get some off of Gaddafi’s dead soldiers.” Indeed, I’ve seen groups of rebels scouring the remains of Gaddafi’s bombed-out tanks and armored personnel carriers along the coastal highway, looking for usable weapons and ammunition. Later, Khalid, a 39-year-old bakery owner from Benghazi who makes a mean bowl of bean soup, showed me his Russian-made Kalashnikov. It was made in 1976. 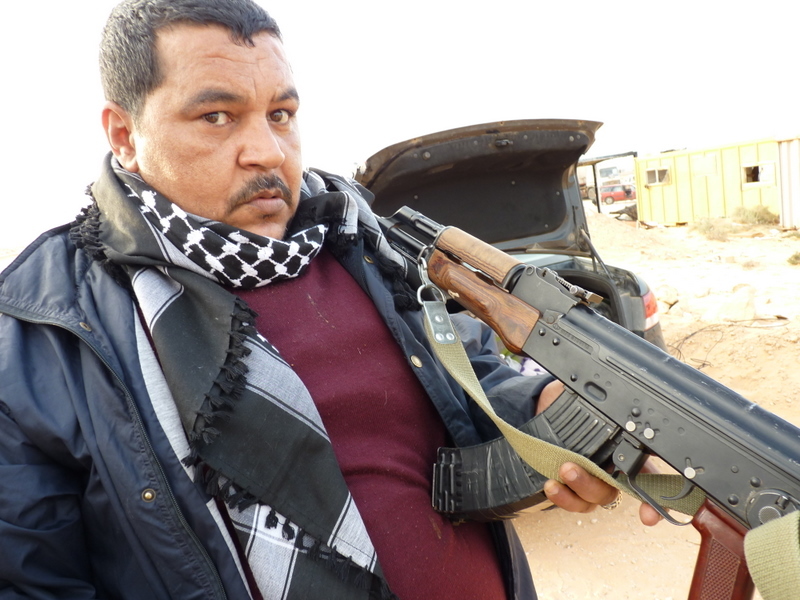 Khalid (39), a bakery owner fighting with the rebels, shows his Kalashnikov. 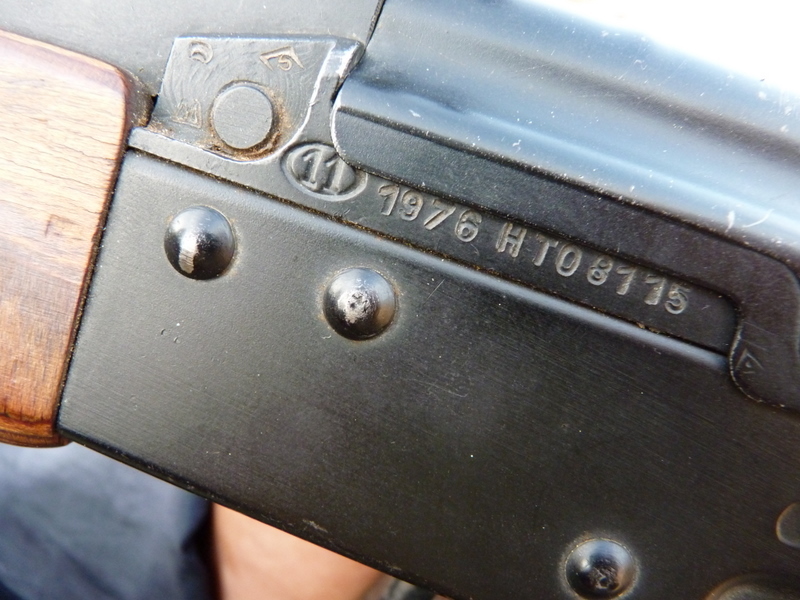 As the serial number shows, it dates to 1976. So what are the ragtag rebels and their outdated weaponry good for? In particular situations – such as street battles within Benghazi against Gaddafi’s Al-Fadil Brigade, or in occasional skirmishes with the Revolutionary Committees – these ragtag fighters have proven effective. Many have demonstrated incredible courage, such as Mahdi Ziu, an overweight father of two who loaded his own car with propane and drove it into a heavily defended gate to save his comrades’ lives and help take the main military base in Benghazi. Everyone in Benghazi remembers Mahdi as a hero. But sometimes it doesn’t make sense to be a hero. 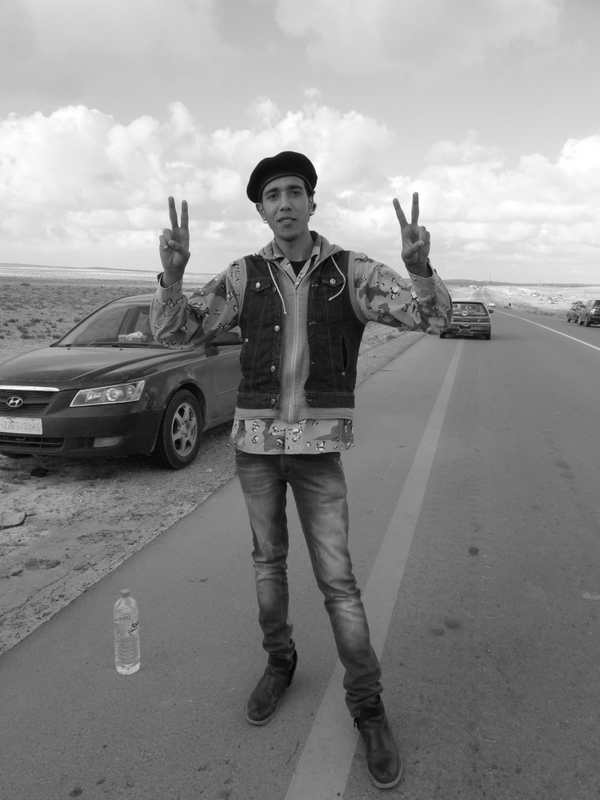 A few days ago, at the front 20 km east of Brega, I was interviewing Faraj, a 19-year-old unemployed rebel who lives at home with his parents. He didn’t appear to be armed. We heard one shell land several miles away. A column of black smoke rose slowly. Faraj and his comrades jumped in their car and left, even before the gang of foreign photographers with me stopped clicking their shutters. The rebels’ rapid retreat is not a function of cowardice, but of the fact that when Gaddafi’s shells begin falling, there’s nothing they can do. Word on the street here is that even the best of the rebels’ artillery can travel only 20 km, whereas Gaddafi’s newer weaponry fires 40 km. In such situations, amateurs with machine guns and light anti-aircraft guns mounted on their pickup trucks, no matter how brave they may be, have little to contribute. So when the rebels retreat in the face of enemy fire, they retreat fast. When shells start to land within earshot and Gaddafi’s forces appear to be advancing, a line of Toyota Hilux pickup trucks and ordinary passenger cars – Hyundais and Kias and Chevys and ancient Datsuns that barely putter along — pull U-turns and start streaming away from the front. These are the ragtag rebels: groups of four or five buddies who carpool to the front in their own cars, high-school teachers and high-school dropouts, petroleum engineers and shepherds and bakery owners, packing their own lunches of macaroni and beans, wearing construction helmets and plastic safety goggles for protection, and carrying the Kalashnikovs they managed to buy on Benghazi’s streets. When the shells start to land, most of these guys leave the fighting to the trained forces who are at the very front lines. There’s not much for them to do anyway. Those at the very front lines, like Al-Sa’iqah, are better equipped, better trained, under organized command, and know what to do in the face of enemy fire. Lacking training, weaponry, and command the amateurs can do little in these situations. There’s no reason for them to stick around and risk getting blown up. Thanks to Boston-based Middle East analyst Zack Gold for his support with this article, and to Xavier Mas de Xaxas for the accordion metaphor. Sadly, I think the rebels are going to lose. They appear to be out-numbered. They have no training, no leadership, and their “heavy weapons” seem to be MGs mounted on the backs of pickup trucks. A reasonably trained combined-arms modern military will destroy them in Libya (given the flat terrain and lack of cover). All you need is some simple tactics (a seeming retreat, then you cut the rebels off by a “hook” move with another part of your force out beyond the horizon in the desert into their rear). Do this two or three times and the rebel “army” will be mostly captured or killed. I think the U.K. and the French individually have the power to pull off a victory in Libya but I don’t see the political “will” to take the losses (meaning the cost in human, fiscal and political terms) such a victory would require. Nor do I see the U.S. – given current political “leadership” – running an “Afghan II” operation. Bottom line: the rebels need military leadership and discipline now, or they are all likely to die. I would not bet my life on the hope that Gaddafi’s army will never figure out how to engage in some simple “operational warfare”. The examples from the Desert war (1941 to 1943) are just too obvious to be ignored for long. Note that the risk you personally run if Gaddafi’s army pulls one of these moves is high since being “behind the lines” could easily place you right in the path of the “cut-off” force. Note: I’m just an amateur military historian with a strong interest in the campaigns of Erwin Rommel and T.E. Lawrence. I have no doubt that there are many U.S. military officers who have better informed opinions than myself, but I don’t see them posting on this blog. phase1 – i was in tripoli – gadaffi massacred so many brave people, the rest were too scared to go out. i dread to think of the amount of young men killed during the first few days of the uprise – machine guns and anti aircraft fire -there were no aircraft – he was using it on crowds of peaceful protesters – however you phrase it – you will never the know the horror – ‘the rebellion was too weak’ – please – trust me they are there – but what is the point in fighting when you would be gunned down instsntly – these guys need help and a bit of back-up, they are not weak – the enemy is sick beyond belief – a difference – they are just ordinary people like you and me! Thank you for making that important clarification. I completely agree with your assessment of the situation in Tripoli, especially since you were there. Countless people have reported the same thing — that from the beginning, the rebellion has been suppressed viciously in Tripoli, with anyone seeming remotely to be defying government orders being shot, and many people disappearing at the hands of the security forces. When I said the rebellion was “too weak,” I didn’t mean that Trabulsis were not brave enough to stand up to Gaddafi. The point was not that the people of Tripoli were weak — quite the opposite. As you say, the people of Tripoli, like people across Libya, have shown courage that most people living in peaceful societies cannot imagine. Rather, I meant that in light of the security environment in Tripoli, open rebellion could not gain enough momentum and critical mass to take over centers of government, military installations, and so on. That is what I meant by “weak.” I was referring to the momentum of open rebellion, not to people. As you say, it’s basically impossible to build such momentum when you will be shot for stepping outside your house. Great article! One addition I would suggest is bringing mentioning the other cities that revolted and additionally giving insight into why the people of beghazi are headed west, that is to help the besieged and occupied cities of the west. Great piece, as always. Now that The Atlantic has published its condensed version, you may wish to include that link at the top (for your followers: http://www.theatlantic.com/international/archive/2011/04/the-accordion-war-libyas-ever-moving-front/73373/)… get a little more traffic there from your loyal readers. I’m trying to get you some more exposure from my end as well. Reminds me of 1942-3 when Alexander/Montgomery and Rommel were rolling back and forth along the same territory.